The CEO who was caught by an elevator security camera abusing a Doberman Pinscher puppy, resigned from the company yesterday. 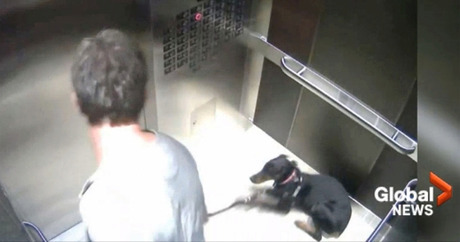 The 50-second video shows Desmond Hague entering an elevator with a puppy named Sade at a Vancouver condo complex. Once the doors closed, he proceeds to kick the animal and pick her up by the leash attached to her collar. The event occurred in late July. Now Hague is out of a job. According to a statement on the Centerplate website, the now-former CEO has stepped down from his post at the Stamford, Connecticut-based company. “We want to reiterate that we do not condone nor would we ever overlook the abuse of animals,” Joe O’Donnell, chairman of the board of directors for Centerplate, says. Centerplate provides concessions to some of the biggest venues and events in the country, including the San Francisco 49ers new home, Levi’s Stadium, and the annual Comic-Con at the San Diego Convention Center. The release of the video sparked a firestorm of controversy, with sports fans threatening boycotts, and some venues questioning renewal of their Centerplate contracts. The Union Tribune, for instance, reported San Diego Mayor Kevin Falconer would “consider all options,” when city’s $17 million contract expires in February. Centerplate provides concessions for Qualcomm Stadium, home of the Chargers. According to The Globe and Mail, Sade is with the BC SPCA. After the video surfaced and Hague’s identity became known, the board originally placed him on indefinite probation, including serving 1,000 hours of community service for an animal-welfare organization, and anger-management counseling. The company also announced a $100,000 donation to establish The Sade Foundation, to promote animal safety in Vancouver. Hague will be replaced by Chris Verros, Centerplate’s COO since 2010; Hague was CEO since 2009. Hague could still face criminal charges in Vancouver.